A recent post by Miko on Kirschner and Gerhart’s work on developmental constraints and the implications for evolutionary biology caught my eye due to the possible analogues which could be drawn with language in mind. It starts by saying that developmental constraints are the most intuitive out of all of the known constraints on phenotypic variation. Essentially, whatever evolves must evolve from the starting point, and it cannot ignore the features of the original. Thus, a winged horse would not occur, as six limbs would violate the basic bauplan of tetrapods. In the same way, a daughter language cannot evolve without taking into account the language it derives from and language universals. But instead of viewing this as a constraint which limits the massive variation we see biologically or linguistically between different phenotypes, developmental constraints can be seen as a catalyst for regular variation. 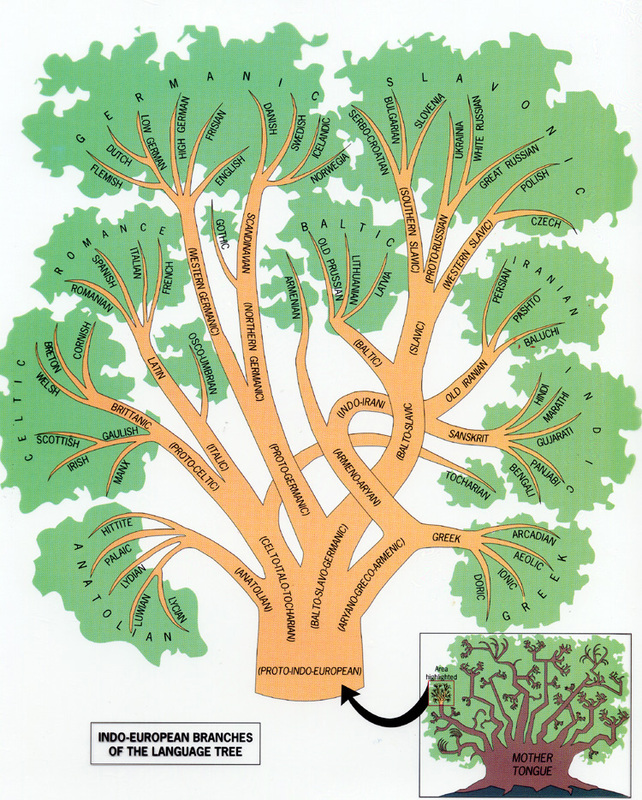 A pretty and random tree showing variation among IE languages. Looking back over my courses, I’m surprised by how little I’ve noticed (different from how much was actually said) about reasons for linguistic variation. The modes of change are often noted: <th> is fronted in Fife, for instance, leading to the ‘Firsty Ferret’ instead of the ‘Thirsty Ferret’ as a brew, for instance. However, why the <th> is fronted at all isn’t explained beyond cursory hypothesis. But that’s a bit besides the point: what is the point is that phenotypic variation is not necessarily random, as there are constraints – due to the “buffering and canalizing of development” – which limit variation to a defined range of possibilities. There clearly aren’t any homologues between biological embryonic processes and linguistic constraints, but there are developmental analogues: the input bottleneck (paucity of data) given to children, learnability constraints, the necessity for communication, certain biological constraints to do with production and perception, etc. These all act on language to make variation occur only within certain channels, many of which would be predictable. Another interesting point raised by the article is the robustness of living systems to mutation. The buffering effect of embryonic development results in the accumulation of ‘silent’ variation. This has been termed evolutionary capacitance. Silent variation can lay quiet, accumulating, not changing the phenotype noticeably until environmental or genetic conditions unmask them. I’ve seen little research (not that I don’t expect there to be plenty) on the theoretical implications of the influence of evolutionary capacitance on language change – in other words, how likely a language is to make small variations which don’t affect language understanding before a new language emerges (not that the term language isn’t arbitrary based on the speaking community, anyway). Are some languages more robust than others? Is robustness a quality which makes a language more likely to be used in multilingual settings – for instance, in New Guinea, if seven languages are mutually indistinguishable, is it likely the that local lingua franca is forced by its environment to be more robust in order to maximise comprehension? The article goes on about the cost of robustness: stasis. This can be seen clearly in Late Latin, which was more robust than the daughter languages as it was needed to communicate in different environments where the language had branched off into the Romance languages, and an older form was necessary in order for communication to ensue. Thus, Latin retained usage well after the rest of it had evolved into other languages. Another example would be Homeric Greek, which retained many features lost in Attic, Doric, Koine, and other dialects, as it was used in only a certain environment and was therefore resistant to change. This has all been studied before better than I can sum it up here. But the point I am making is that analogues can be clearly drawn here, and some interesting theories regarding language become apparent only when seen in this light. Naturally, much of this will have seemed intuitive. But, as Miko stated, these are useful concepts for thinking about evolution; and, in my own case especially, the basics ought to be brought back into scrutiny fairly frequently. Which is justification enough for this post. As always, comments appreciated and accepted. And a possible future post: clade selection as a nonsensical way to approach phylogenic variation. The trouble centers on a 2002 paper published in the journal Cognition (subscription required). Hauser was the first author on the paper, which found that cotton-top tamarins are able to learn patterns – previously thought to be an important step in language acquisition. The paper has been retracted, for reasons which are reportedly unclear even to the journal’s editor, Gerry Altmann. Two other papers, a 2007 article in Proceedings of the Royal Society B and a 2007 Science paper, were also flagged for investigation. A correction has been published on the first, and Science is now looking into concerns about the second. And the Globe article highlights other controversies, including a 2001 paper in the American Journal of Primatology, which has not been retracted although Hauser himself later said he was unable to replicate the results. Findings in a 1995 PNAS paper were also questioned by an outside researcher, Gordon Gallup of the State University of New York at Albany, who reviewed the original data and said he found “not a thread of compelling evidence” to support the paper’s conclusions. Hauser has taken a year-long leave from the university.